So, I wonder: How many of these elements survive in the new ‘V?’ Will there be another Holocaust theme? Maybe it will evoke memories of a different tragedy, perhaps 9/11. Will we be able to tell humans from Visitors? Most importantly, are they still big ugly green reptiles underneath? 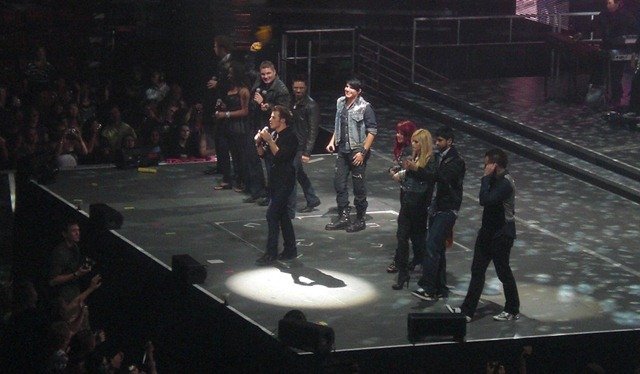 Pictured above, American Idol 8 winner Kris Allen leads the Top 10 in a finale performance of Journey’s “Don’t Stop Believin’.” Behind him (L-R) are Scott MacIntyre, Lil Rounds, Michael Sarver, Danny Gokey, runner-up Adam Lambert, Allison Iraheta, Megan Joy, Anoop Desai, and Matt Giraud. I guess you could say I’m a pretty big American Idol fan. I have now been to four of the eight seasons’ tours. Season 2, 4, 5, and 8. This group was simply too good to pass up. I can easily see about five of these Idols getting signed and putting out quite a good CD. Michael – I’ve got to say he was really much better in person than I remember him from the show. He had a good command of the stage and was vocally pretty strong. He did a surprisingly good job of opening the show and getting the crowd pumped up. Scott – Scott never ceases to amaze me. He’s best when he’s sitting at the piano belting out a song. He reminds me of a good 80’s pop singer. 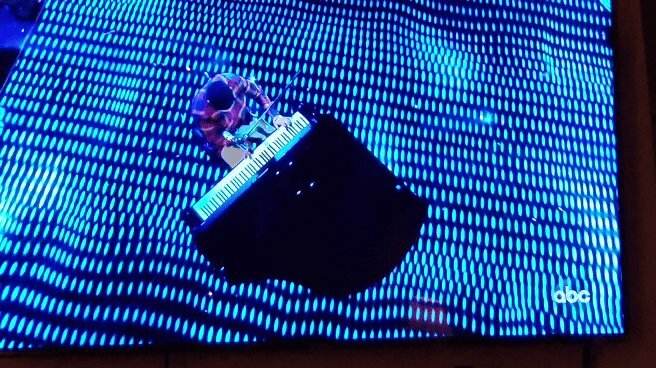 I actually have always though Scott would make a better songwriter/arranger than a singer, but after hearing him on the tour, I think he could make a compelling CD. Lil – Got to say right away, my favorite song from Lil was “Single Ladies.” I like the energy she brought to the song and I liked the arrangement and all the video effects going on at the point. Very good performance. Tina really liked her outfits and her shoes. Anoop – I tend to like Anoop on his upbeat songs more than his ballads. I liked his version of “My Prerogative” best. He’s very talented, he’s got a great voice and showed some personality on tour. He’s one of the ones I could see with a future CD. Allison – Finally, we’re getting to the meat and potatoes of the evening. Starting with Allison there is a whole new electricity in the arena. I think “So What” was probably her strongest song (other than “Slow Ride” with Adam. That’s a whole ‘nother level…). She’s definitely got the whole package to be a successful star, possibly up there with Kelly Clarkson. Adam – For me, it seemed like Adam was the star of the show tonight. He had the loudest screams, the best introduction, and was certainly the most entertaining (overall) of the night. The crowd really was as loud as I’d ever heard it at any Idol concert I’ve been to. Sometimes I think the fans of the runner-up are more vocal simply because they feel compelled to show extra support for their contestant. “Mad World” was one of the best songs on the tour. It just fits him right and when he slows it down, he’s just right on. And, as I’ve already mentioned, his duet with Allison on “Slow Ride” is just great. Kris – And of course the show builds up toward the appearance of the winner, which is made all the more interesting considering that Adam’s introduction is so “in your face” and Kris’ is more laid back. Again, just the difference in their styles. Kris is very good at what he does, and his performance of “Heartless” will not disappoint any of his fans. And when Kris starts into “Hey Jude” the whole audience gets involved by digging out the cell phones and lighters (some with cell phones with lighter apps on them) and the whole arena begins to sway back and forth. And the whole evening is brought to a close by a little bit of Journey’s “Don’t Stop Believin’.” Very good close to the show. I actually could have used more group numbers. In the past I thought there were too many, this year not enough. I thoroughly enjoyed the concert this year. The Idols did not disappoint. Adam’s up first… What will he choose as his favorite of the season? He’s had quite a few memorable performances. How can he settle on one? Adam – Oh, “Mad World.” Good choice, since Simon gave him the standing “O” and half of America didn’t get to see it the first time anyway… Man, he’s channeling his inner Edward tonight… Very good performance. That’s right up his alley. The only thing it really lacked was the “surprise” factor that Adam usually brings, but that should be expected (duh) ‘cause he’s done that song before. Yes, Randy, “Twilight.” That’s it. I liked the fog effect. I like the added drama. Adam – Song two. I remember Taylor Hicks singing this during his audition. Pause. What the… hold on… Wow, man. First off, that has got to be the absolute weirdest song choice. Ever. But, it didn’t really matter. He still “sang his face off.” But what’s funny about that performance is this: I don’t think he’ll gain any new fans because of it. The anti-Adam contingency will still say “he’s screaming too much” but his die-hard fans will love it. Kris – Kris, round 2… See, I like how he scales it back. He just is the opposite of what Adam is, man. And I mean that in the best way possible. That is where Kris shines, when he “acoustics it up a little bit.” Oh, Simon, I think he did. I think he definitely made the song his own. But I will still agree that Round 2 goes to Adam. Now comes the performance that will basically kick-start their careers. This is the song they will be singing repeatedly, night, after night, after night during this summer tour. It’s time for the “Winner’s single.” No boundaries. Adam – That was good. I like the song, and it’s nicely enough written (kudos Kara) that both Adam and Kris can make that song their own. I don’t totally agree with Randy, but I did see a few cracks appear in his voice for the first time this season. I like those kind of “positive uplifting mountain and hurricane” songs Simon. I think it’s the obligatory “Coronation Song” that is befitting a newly crowned Idol. Did Adam seal it up with his version? Well, it’s too soon to tell. Kris – Okay, the last performance of the season. I like Kris’ arrangement. Talk about pitchy though. At first I was thinking this song was too low, now I’m thinking it’s too high. Same cracks in Kris’ voice. What I really like about the same song being sung by both finalists: I like hearing the different arrangements. Kara is right. Don’t hold that song against Kris. It was a little weird for him. Seemed too low, seemed too high. To be honest, in analyzing the last song, I think Kris’ recording would be better than Adam’s… But I think Adam sang it better. To me, Kris’ second song was his best of the night. It’s been an amazing season of Idol. 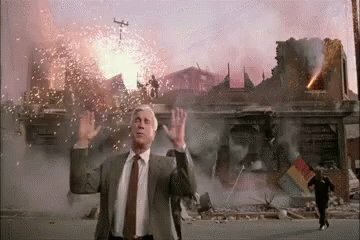 With all the drama and all the controversy of this season, it’s come down to this, tonight. Kris has certainly proven himself worthy of being in the final two, but I’ve still got to go with Adam to win the whole thing. That’s my personal preference. But, to be honest, I think the American public will vote Kris the winner of American Idol 8. And I don’t really have a problem with that. I can completely understand why someone would choose Kris over Adam. Like I said, to me, Adam is the better entertainer, has been more consistent all season, and has the best chance for all-around commercial success after the show ends tomorrow night. But I just have a feeling that America will vote Kris the winner. But I don’t necessarily think it will end up that way… I am totally looking forward to tomorrow night’s finale… I’ve been reading the tweets of @dannygokey, @michaelsarver1, @MGiraudOfficial, @IdolScott, @agcruc, and Anoop’s which (for some reason) this site won’t let me type (but it’s @Anoop (Dog with two g’s) Desai) – and it’s been really interesting to read their thoughts over the past few days. This has been a very talented group of singers, and I can’t wait to hear the music that this group generates on the charts. But anyway, I just wanted to note how much I enjoyed watching the Adventures of an Incurable Optimist last Thursday.